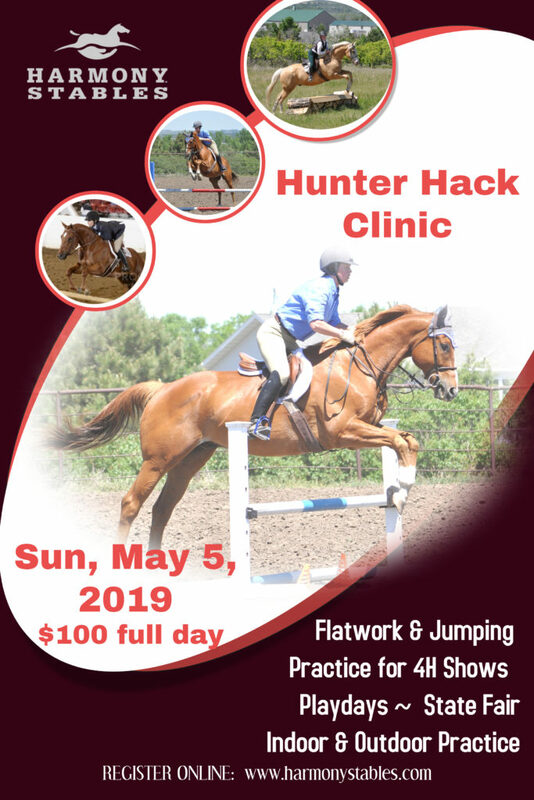 This clinic is designed to help prepare horse and rider for the Hunter Hack Class, which consists of flat work, a line of jumps, a change of direction, a hand gallop and a halt/reverse. The purpose of this clinic is training for steady rhythm and straight approaches without rushing the fence, learning proper body position over fences, counting strides, smooth transitions, practicing simple or flying lead changes, understanding the hand gallop and cueing your horse for the halt. This training goes from 9am to 5pm. Arena will be open at 8am for warmup. We will be covering tack check, flatwork or railwork, body position, walking the course and jumping. We will start indoors and move outside if weather allows. If there is time and the weather permits, at the end of the day, riders can opt to practice a few “obstacles” in our outdoor Hunter Derby Course on the grass jump field. Instructor Cherie Sanstead has been teaching low-level Hunters for the past 10 years. Her emphasis is on proper body mechanics of rider and teaching the fundamentals of classical Hunt Seat riding, to prepare both horse and rider for a safe jumping round. She has trained under several top-level Hunter/Jumper riders. She also has trained under Grand Prix, Gold and Silver medalists in Dressage. She has also dabbled in some Reining and Natural Horsemanship training, as well as being certified in Equine Learning Activities. All riding participants must bring their own horse for this training. Any cancellations will incur a $15 processing fee. NO CANCELLATIONS prior to 14 days before the event. Any cancellations after that date will require rider finding own replacement or forfeit clinic fee.